Apple and Capital One appear to be among tenants lined up for a new office building under construction at 314 Main Street in Kendall Square. Apple appears to be headed for Kendall Square. The tech giant has signed a letter of intent to lease one floor of a new office building that the Massachusetts Institute of Technology is building on Main Street in the booming Cambridge business district, according to people familiar with the deal. Bank and credit card company Capital One has also agreed to lease three floors. The leases at 314 Main St., which should be finalized early next year, are the latest sign of big-name tech companies — and not just life sciences giants — growing in Kendall. 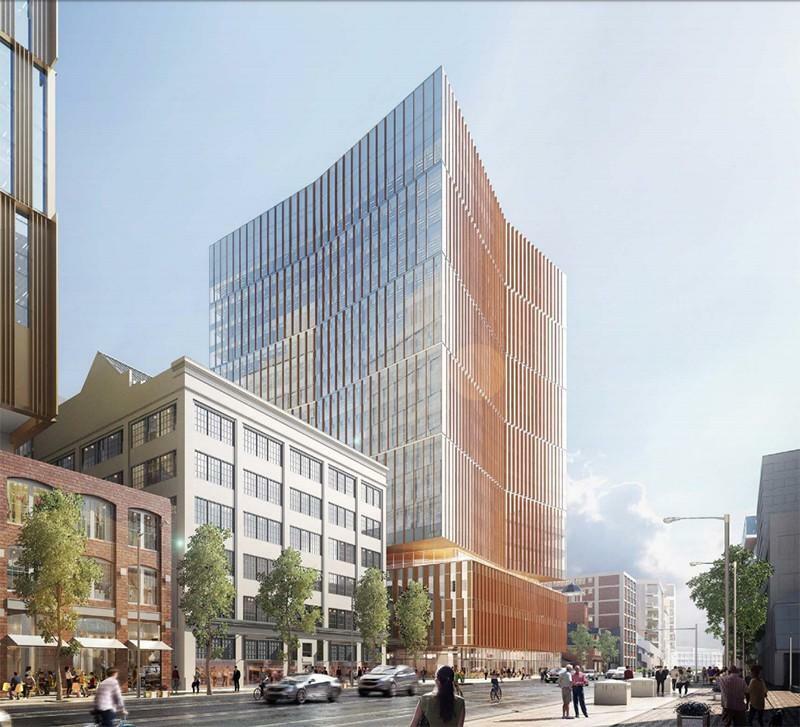 Google is expected soon to lease a newly approved 18-story office tower that will be built across the street, while Amazon and Facebook already have offices in the neighborhood. Apple last week announced plans to add “hundreds” of tech jobs in Boston as part of a nationwide round of expansion but shared few details on where they’d go. The company currently rents 11,500 square feet in One Broadway, a nearby building also owned by MIT, according to documents on file with Middlesex County. The move to 314 Main would give it room to expand, though the company would still have a far smaller presence here than other tech heavyweights. Apple representatives did not return messages Wednesday. Capital One, too, would probably be expanding. It has a small office in the Seaport District, along with its coffee shop/bank branches around the region. At 75,000 square feet, there is room for hundreds of employees at 314 Main. A Capital One spokeswoman declined comment on any potential move. MIT, which does not typically discuss office deals until a lease is signed, also would not comment. The deal was mentioned in an office market report published Tuesday by Cushman & Wakefield, though Richards said he had no direct knowledge of it. Other real estate executives with knowledge of the leases confirmed details but noted it is not yet finalized. MIT has pitched the building — which will be next to the MBTA’s Kendall Square Red Line stop — as part of a “new front door” to the university. Its lower floors will be home to a new MIT museum. Boeing subsidiary Aurora Flight Sciences, which works on automated flight, has already signed a lease for four floors, or 100,000 square feet. Five floors remain on the market. The mix is a contrast from recent megadeals — like Sanofi’s 900,000-square-foot lease at Cambridge Crossing, announced Monday — where one company takes all or most of a building. It’s a strategy that makes sense for MIT, Richards said, so its “front door” won’t be dominated by a single tenant. It also makes sense for the companies, giving them access to MIT brainpower.